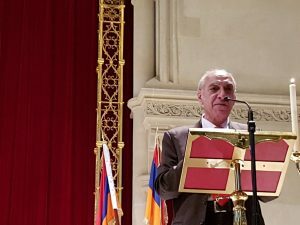 On the evening of Sunday 23rd April, 2017, a Commemorative Evening in memory of the victims of the Armenian Genocide took place at the Saint Yeghiche Armenian Church in Kensington, London. The event was organized by the Executive Committee of the Armenian Community Council of the U.K. led by the Committee’s Chair, Mrs Matilda Megerdichian, in cooperation with the AGBU London Branch. The attendees were treated to the melodious voice of soprano Ms. Tereza Gevorgyan , who sang with great feeling and passion, a selection from the songs of Komitas followed by arias by Puccini, Rachmaninoff, Abrahamyan, Tigranian and Chitchyan. 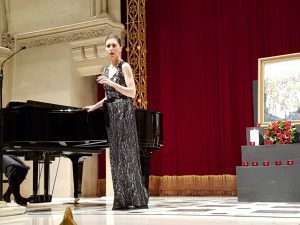 Ms Gevorgyan was accompanied by the accomplished pianist, Ms. Hannah Quinn. The Community was also greatly privileged to have as guest speaker, the scholar and historian Professor Dr. Raymond H. Kevorkian, who had travelled specially from France to speak about his work and the state of research about the Armenian Genocide at the present time. Dr. Kevorkian’s participation was kindly arranged by the AGBU London Branch. Dr. Kevorkian referred to the fact that detailed and in-depth research about the Armenian Genocide had been carried out in the last twenty-five years and that many new and previously unknown facts had emerged. In particular, he referred to the fact that many Turkish historians were interested in researching the Armenian Genocide, not necessarily to help Armenian people but because they realised that Turkey would never become democratic until this “taboo” subject was properly studied, openly discussed, and resolved. Dr Kevorkian referred particularly to Dr. Taner Akcam, who had discovered several interesting and revealing and irrefutable details about the methods and detailed planning of the Genocide by the Ottoman Turkish Government leaders from recently unearthed Turkish archives. 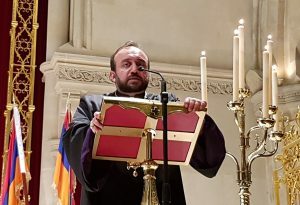 The evening was brought to a conclusion by closing words and prayers by Bishop Hovakim Manukyan, the Primate of the Armenian Diocese of the United Kingdom and the Republic of Ireland. 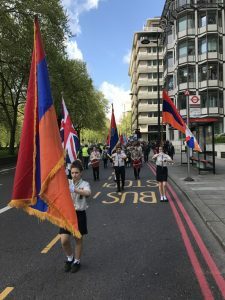 On Saturday 22nd of April, 2017 a Commemorative Procession was held organised by the Armenian Community Council of the United Kingdom’s Campaign for Recogn ition of the Armenian Genocide Committee (CRAG). 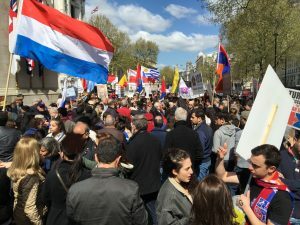 Some 2000 or so members of the Armenian community marched from the Marble Arch in Central London, through the busy streets of London’s West End, Piccadilly, Trafalgar Square, culminating at the Cenotaph Monument on Whitehall near the Houses of Parliament and Downing Street. 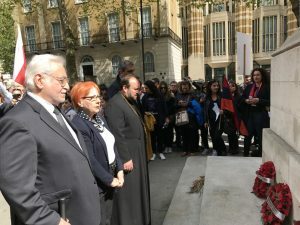 At the Cenotaph, in memory of the 1,500,000 victims of the Armenian Genocide, prayers were said and wreaths were laid by the Armenian Church Diocese of the United Kingdom, the Armenian Embassy, and the Armenian Community Council of the United Kingdom. The procession was under the direction of CRAG Chairman, Mr Raffi Sarkissian and the procession was led by scouts of the London HOMENETMEN Armenian Scouts whose senior members, as in previous years, actively assisted in providing equipment and organising and maintaining the orderly march of the procession. Other major Commemorative events included a Remembrance Ceremony at the Commemorative Apricot Tree planted some years ago at Ealing Green in the London Borough of Ealing which has a very high concentration of Armenian population. At the ceremony present were the Mayor of Ealing, the Leader of the Labour Majority in Ealing Council, Councillor Julian Bell and Mr Stephen Pound MP, Labour Member of Parliament for Ealing North. The Armenian community is grateful to Mr Pound MP and to Mr Bell who a few years ago were instrumental in arranging for the Ealing Borough Council to allow the Armenian Community Council to plant an Apricot Tree in Ealing Green and to dedicate it to the Memory of the Victims of the Genocide. Additionally, on Monday 24th of April, 2017, a well attended all-day solemn vigil was held outside the Turkish Embassy in Belgravia Square, London, which was organised by the AYF London.